Also known as my Wedding Bible. I debuted it before during the November Update Video, but when we started meeting with our invitations lady, caterers, and DJs I realized she just wasn’t up to par. 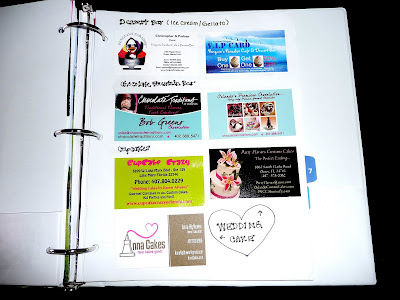 Originally, I had simply put all of my vendor information into one place, organized it with dividers, and that helped…but I didn’t realize how much I didn’t have in there that I absolutely needed. I really wanted to start carrying around a notebook that reflected our wedding filled with pictures, print outs and ideas to help show our potential and current vendors what the heck we’re talking about! 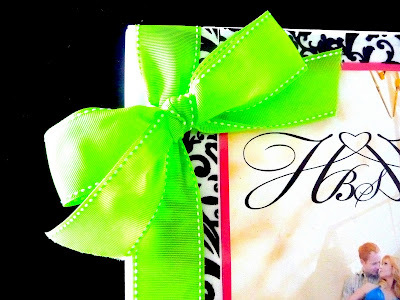 First, I wanted to just go out a find something that looks a little more like me and that would keep me more organized…but I quickly realized that a new wedding notebook would be an unnecessary expense, and I could easily make a great and personalized notebook myself! 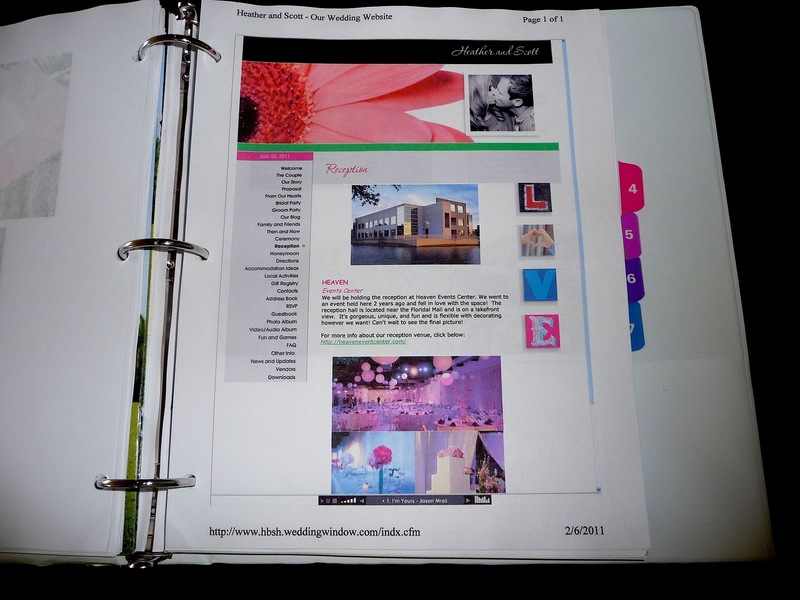 3 Ring 1 1/2′ Notebook – I got it in white, but you can get it in a different color if you wish! To start with, I knew the cover of my new and improved Wedding Notebook HAD to reflect the entire theme of our wedding. I wanted it to show our contemporary style, so I chose to start out a cover design with our Save the Date photo. It was also important for me to have our monogrammed HBSH logo easily accessible, so I decided to add that on the cover picture so that I always had it in front of me. Next, I wanted to spice it up a little so I added a pink border to the picture, printed it out and put it in the front cover slot. 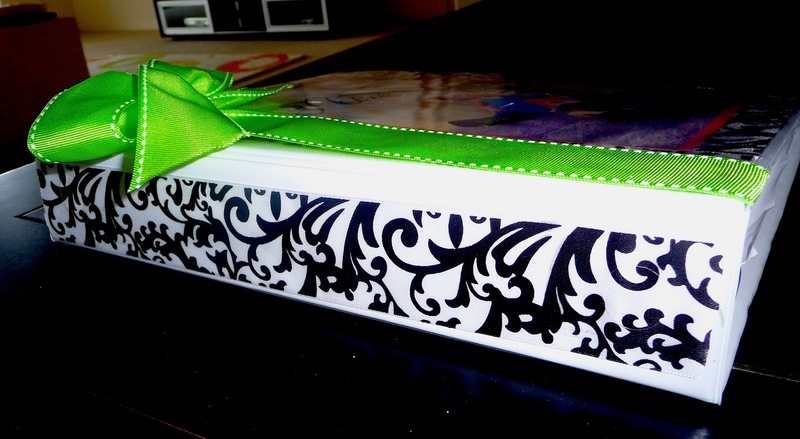 Not completely pleased with this, I noticed there was enough room to add some of the clear and black ribbon on each side as well as on top of and below the photo. Good thing – because this was a great opportunity to show off our wedding colors, and I guess the cat’s out of the bag now on that one huh?! When I sat back and looked at it…I thought it was cute, but that it was STILL missing something. 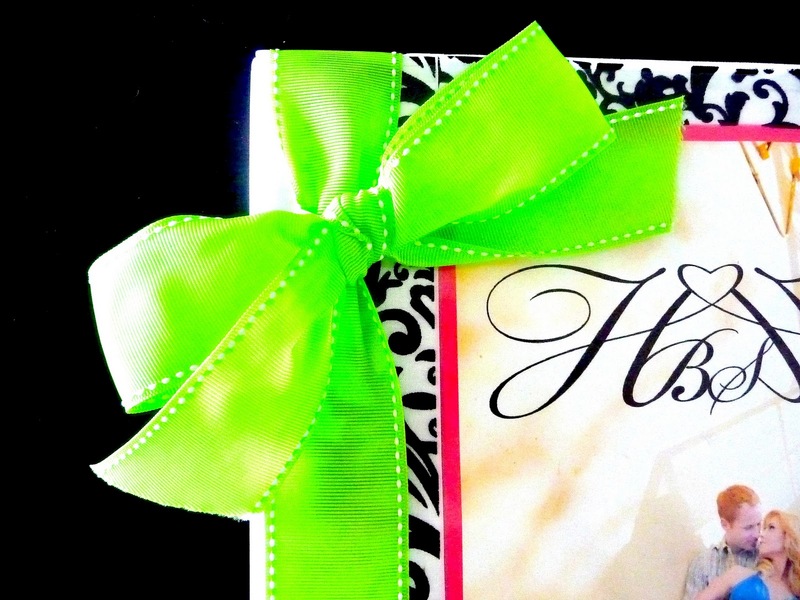 So, I got the lime green ribbon out and decided to add a big green bow to the left side…perfect! Next, I wanted to make the side of the notebook reflect what the front looks like by adding a strip of the black and white ribbon down where you would put a vertical label. I used the white and black ribbon, as opposed to the clear and black ribbon for this because it was a little sturdier and easier to slide down. I think that pretty much covers all of the bases. OR, you can make your own spreadsheet in excel to make it as accurate to your personal needs as possible! Follow this video, this lady from about.com makes it so easy! You can go on any wedding planning website like weddingwire.com or weddingwindow.com and sign up for an account if you want to handle all of your budget analysis and to-do lists on the computer. Example: http://www.weddingwire.com/wedding/UserMyChecklist Otherwise, there are plenty of printable timelines for you to go off of to get ready for your big day. 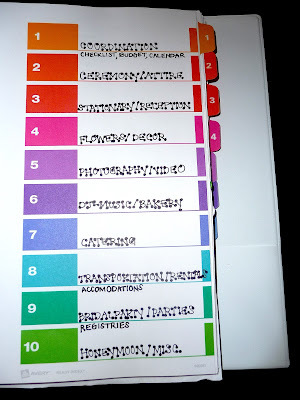 http://wedding.weddingchannel.com/planning/checklist/12-10months.asp and there SO many more out there! Simply google “wedding checklist timeline” and you’re bound to find something that suits you. 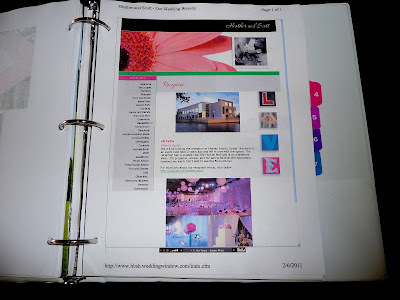 Also under the COORDINATION tab, is where I keep all of my wedding coordinator’s information. 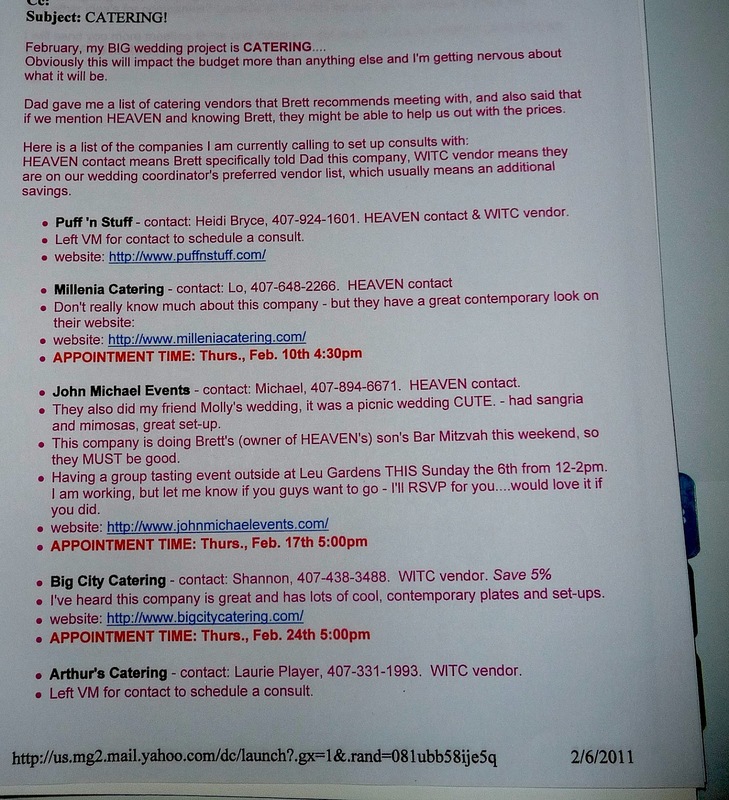 Not only her contact info, but also her preferred vendor list, wedding checklist, and anything she has sent me so far. I feel like this tab keeps the entire Notebook organized. OK – moving on to what I really created this new notebook for: PICTURES! Now, I can’t share too much with you because obviously that would give too much away. What I can show you though, are some pages I printed out and put together to keep in my notebook. This way, even from this page they can tell a little bit about what we’re going for. Next, of course I have TONS of pictures printed off and stuffed throughout this thing of ideas for floral, decor, invitations, and everything else. 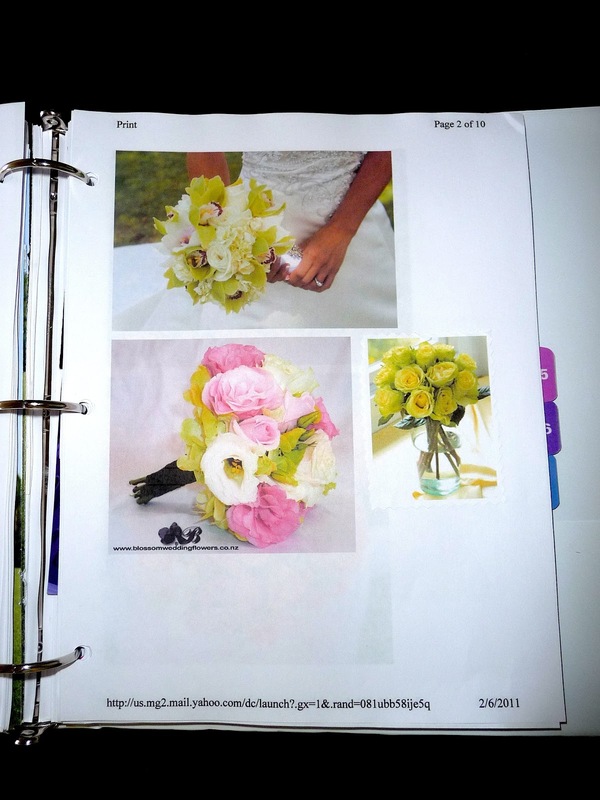 I can’t really show you all of that, but I can show you one of the floral pages. Originally, Scott and I were planning on using more white mixed in our floral, so I pulled and printed all of these pictures up. We have changed our minds since then, and you’ll see what we’re talking about when the day finally gets here! 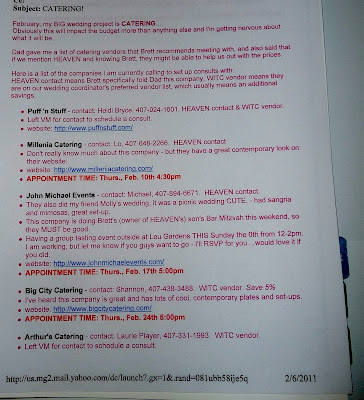 One thing I found A huge help to myself that I can’t believe I didn’t to all along is printing out e-mails. I am always putting e-mails together and sending them to myself, my groom, my mom and sometimes members of my bridal party for ideas, meeting times, notes, and questions. When I put something together that has a lot of useful information – like catering company information – I print it off and stick it in that section of the notebook. 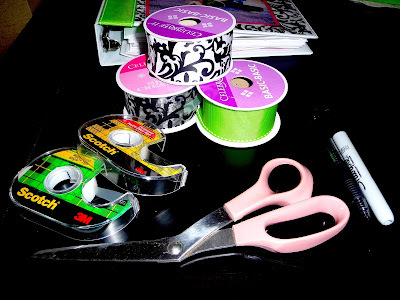 I mentioned before in the February Focus Video – I am a bit of an Organization Freak! Can I spell it out any more than this? lol…sheesh! 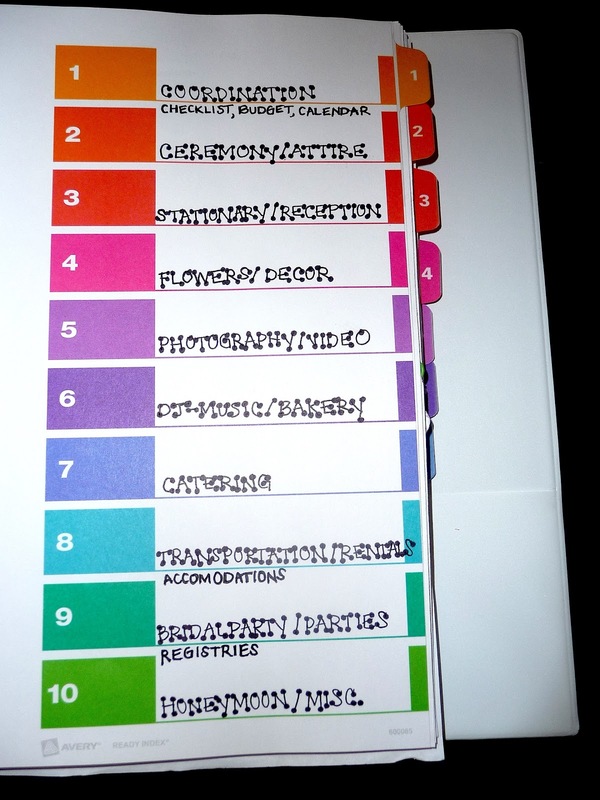 I have always had a thing for using different fonts, colors, highlighters, tabs, and pictures to organize EVERYTHING. Anyone who has ever sat next to me in any class from middle school on, knows this about me and are probably laughing to themselves about this one. this helped me SOOO much! i will not be tying the knot until april of 2014 but i am getting an early start on everything seeing as i’m a huge procrastinator! thank you so much! YAY! So glad you found it then… that notebook was my absolute best friend throughout the process of planning our wedding! If you haven’t been there already, pop on over to my Wedding Page. There’s tons of advice from yours truly. 😉 Good Luck!